Translation of Youtube Video of Bp. Longinus’ sermon on the Protection of the Theotokos in October, this year (with a transcript here). “Why do we live? Why are we, brothers and sisters, on this earth? In order to do evil? To kill each other? No! Blessed are the peacemakers, for they shall be called the children of God. Spread the good. Love and forgive. Life is short, and the last times are upon us. The Lord will come to judge this world. How He will find us, so will God’s judgment be upon us. God forgave all. No sinner is left on the ground that can’t find forgiveness. He said, “I came to forgive.” This was the Lord’s will–to forgive all sinners, and to take us all into the Kingdom of God. But, today, people do not want to serve God. Thus I have told you that already are come the hard times. The Orthodox people are being deceived by patriarchs, bishops, priests, who want to show a different way to eternal life, but not the way which the Lord has left to us. 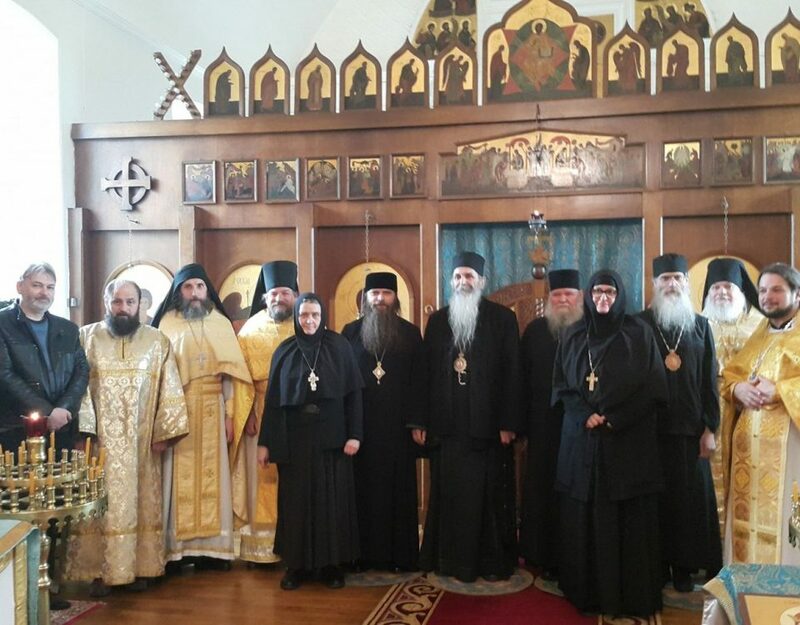 What do you think, brothers and sisters, that the Holy Fathers of our Church could get together the Orthodox, Catholics, Protestants, Baptists, Jehovah’s Witnesses, say: “We are in Christ, brothers and sisters”?! NO! The Lord separated heresy from truth. And they [i.e. the heretics] are the enemies of God, the enemies of our Orthodox Church, the enemies of the Mother of God. I have nothing against a man [i.e. personally against an heretic], but, against heretical teachings, we must not allow this rebellion into our Church, for in our Orthodox Faith these things are blasphemy. Today we pray with you, crying, and asked for the Sacrament of the Body and Blood of the Saviour. But, do we come into the church, and dance like a “Cossack” like they do in the church in Moscow? If so, it would not be the Church of God! But, it would be instead the Synagogue of Satan. These people have lost a sense of what it is to be Christian. How can we dance before the Altar?! How can we say, brothers and sisters, that we should have different beliefs and teachings in our Church? Do not believe that! These are the people who are preparing the way for the Antichrist. 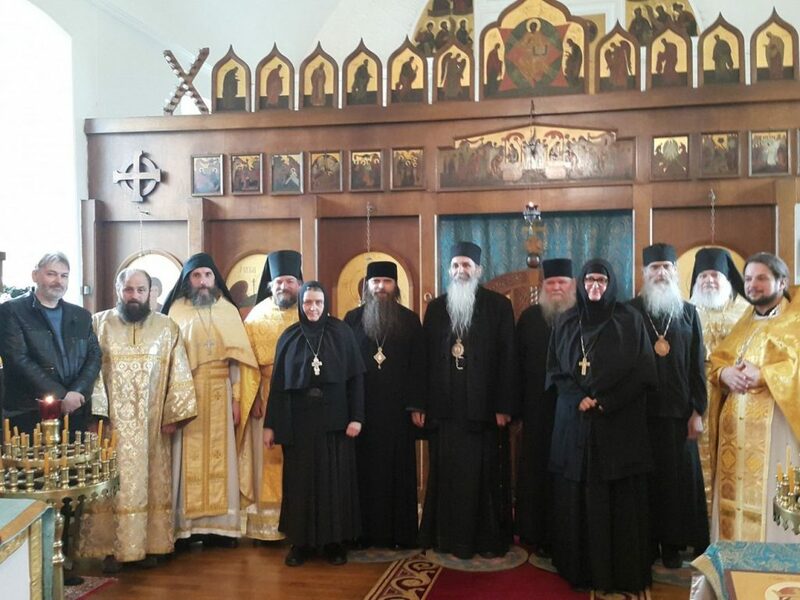 They are apostates and traitors to our Holy Orthodox Faith. Brothers and sisters, we ask all of you to stand in the Truth, and the Right Way! The holy fathers said that such a time as this will come, and they will betray you, and will make this Synod [i.e. 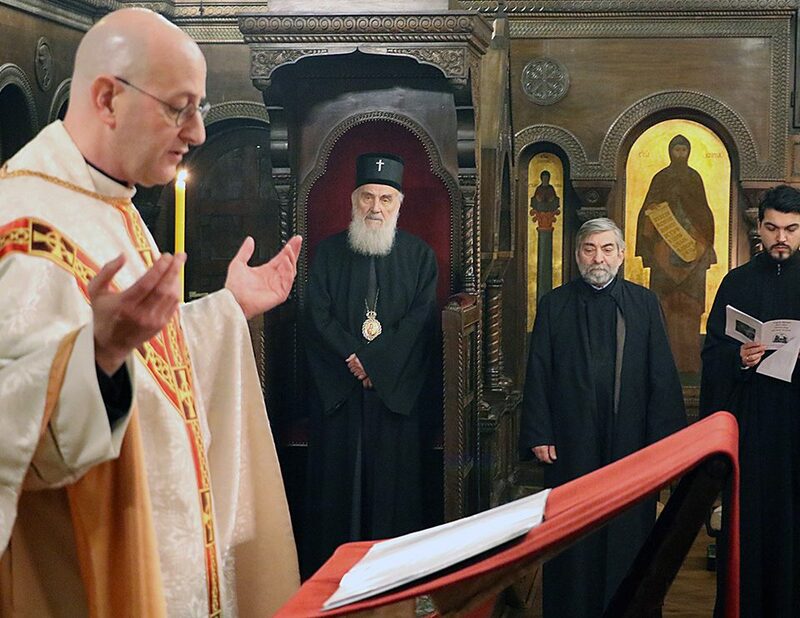 the Cretan Synod], the Pseudo-Synod, the Synod of the devil, the Antichrist, and they will betray the Truth of God, and persecute you. We had thought that it was not now, but later, but, brothers and sisters, we see them taking the holy of Our Fathers Seraphim of Sarov, and giving these holy relics to the heretic Jesuit Pope! This sin cannot be forgiven, when our bishops and metropolitans remove the Throne [Holy Table] into the middle of the church, so that people see the service in the church, not in the Altar behind the iconostasis–this is heresy! Latin heresy! And they are afraid of nothing! Yet, it is the time. The time has come, brothers and sisters, to pray, to ask the Lord God to stop them and this abomination. But the holy fathers said this abomination will be so! It will come! I cannot even give the words to speak about this most shameless things which has come into the Most Sacred Place, the Altar, the Altar! Then they danced in Moscow [i.e. in front of the Altar]. 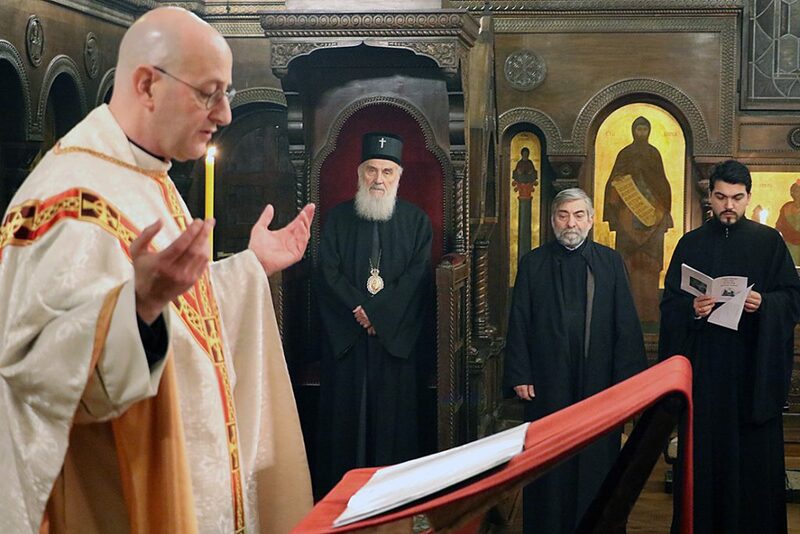 So the Patriarch did not see how they dance before the Altar, and dance like coassacks and sing sectarian songs?! Traitors, apostates, the servants of Satan! I do not know how much time there is left, but, I ask, let us repent and come to the Lord God. I want to have peace of mind. I ant to be with God and with His people. I’m not going to hide from you. I will always tell the truth. 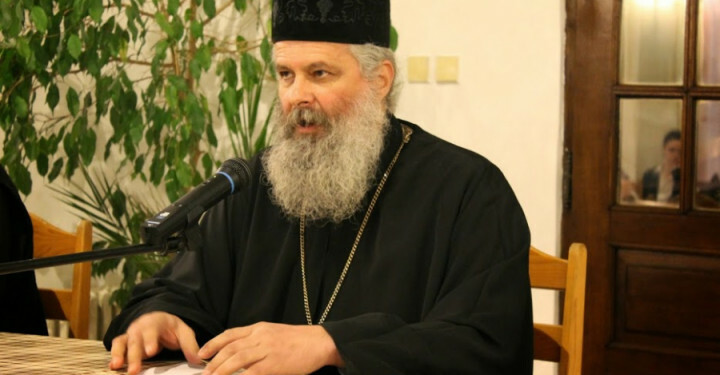 When we closed the Synod [Synod of the Moscow Patriarch in February of 2016], it was said, “no one should what is going on here.” And why should the Church of God not know? Why is it that people who have built churches and monastery should not know the truth? And for what do we need you, brothers and sisters? So that you can be fed, clothed, and build a church, and then we will conduct you into the abyss of eternal torment! Shame! Shame! Repent, Orthodox! Come to your senses! It’s time for confession! You do not need to be afraid! Do not be afraid of anything! Be true to the Lord God, our Canons of the Orthodox Church, and listen to the Holy Fathers, who all wrote and told us what times will come, and they told us what we should do. Thank God that we did not go to this Synod [Crete], but on 2-3 February [MP Council of 2016] there was the document of this Synod. 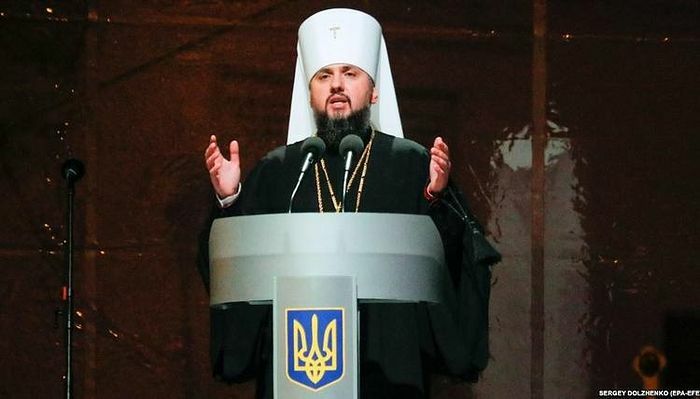 They said that it was ‘good’ and does not violate the tenets of the Orthodox Church, and that we, the bishops of the Russian Orthodox Church ‘agree with this’! Why no consent? Should it not be like the other Synod [i.e. MP Synod of Feb. 2016]? To collect, to withrdaw the document that is for the Antichrist, the devil, but no one is listen, and everyone said, “sit down; it’s all been voted on; it’s okay”! We will not do as they tell us, because this is the way to eternal perdition. We are free people. I do not believe in God because someone forced me to believe, but, I believe in Him because I cannot live without Him. My life was very difficult. From childhood to the present day. And I have always felt the hand of God and God’s help. And always the Lord sent me, that I should do. I did not come to the monastery or the service of God, to have praise, or to have others bow before me. I come with you, to serve the Lord. He is everything to us, and we are nothing. And for that, I ask you all with all my heart, I beg–take care of the Orthodox Faith! Protect the Truth of God! We will not be enough, but the Lord will not leave us! Dear brothers and sisters, I congratulate you all on this Holy Feast of the Holy Virgin. And I ask mercy that her Protecting Maternal care be given for us sinners, and that it cover all the faithful and all the people on this earth with her holy veil. Do not be dismayed. Do not be afraid, brothers and sisters! It may be the last days have already come. Heave war is to be found! What a bloody battle! Hundreds of millions of people will die! But do not be afraid of anything; if we are with God, if we walk with God, if we stay with God in Truth. Everyone says they are with God, and unite for the sake of love, in spite of the fact of what they believe. The heretical words of our patriarch, when he says that God is like the sun, and the ray going out from the sun, is all heresy; all religions on earth somehow then lead to the one God?! We are not told this in the Fathers, this is not written anywhere! This he says because his teacher is Metropolitan Nikodim (Rotov), who died like a dog at the feet of the Pope. It was foretold for him not to go there, and that he would die. When he kissed the pope’s slipper, he then died at his feet. Why did we not stop when this miracle was seen? Why did we go blindly and imagine another Way than the One Way of Salvation the Lord has left us– the narrow path. One Church has the Lord left us and said that “the Gates of Hades shall not prevail” against the Church. The Lord Jesus said, “I will build My Church,” and that “I am the Head of this Church,” not the Pope, not the Patriarch, nor me, a sinner. The Lord Jesus is Head of the Church. Have you come today for my sake, to pray to me? Who am I? We are together unworthy and sinful; we came to ask the Lord. I am ashamed to look at God for my sins are many and I must speak during the Liturgy, and say as we serve: “O Lord be merciful to us sinners! O Lord! Forgive us, O God! That how I approach God, and how you should come to the Lord God. For we are nobodies. Brothers and sisters, forgive me. I love you. I am happy to be with you. But I want to stay in the Truth of God, because the Lord says: “All sins are forgiven, but the sin against the Holy Ghost cannot be forgiven, neither here nor thereafter.” Heresy–this is the sin against the Holy Ghost…….I know that God alone is without sin. The rest of us are all sinners. Then how can the pope be without sin? God does not need a deputy–the Pope went against the Gospel. 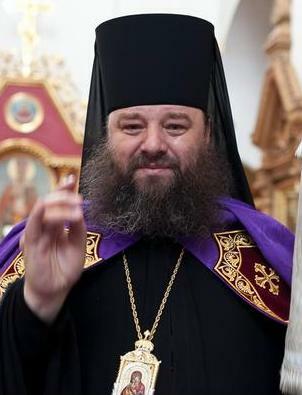 And you can see this servant of the Antichrist, Metropolitan Hilarion [Alfeyev], saying that we need to change the Bible! The Bible now is bad! [i.e. Met. Hilarion want’s a translation in modern Russian] How then were people saved up to this day? They say it is necessary to change the Liturgy because the people do not understand! [i.e. the desire to switch from Church Slavonic to modern Russian–note] They think that all are fools, but they are alone are smart. Lord, teach us! And be merciful to the Church of God and the people.